Is there a simple scripting method to test if a song is already in a playlist? I'd like to avoid the MM duplication confirmation page I would get otherwise. Obviously one could go through a loop of each song in playlist, but I'm wondering if it isn't easier than that. Re: Clever method to check if song in playlist? The Classification tab of the Properties window will also show what Playlist(s) a file belongs to. You could accelerate that by exiting the loop in the THEN. 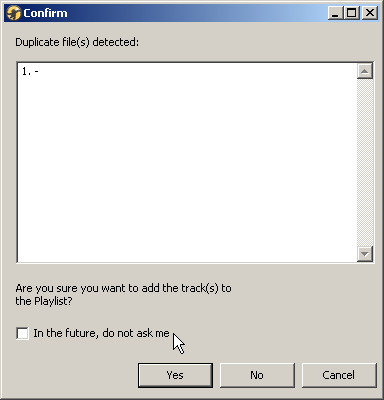 Just Guessing wrote: Is there a simple scripting method to test if a song is already in a playlist? I'd like to avoid the MM duplication confirmation page I would get otherwise. Don't you get this option to avoid that confirmation dialog?